Hey Guys, I read your post It was really amazing for me. I am very glad for this post. I will be happy if you post here more. Thank you so much for this post. I have also switched out all my cooking with coconut oil, my kids now love the subtle coconut taste that gets added to what we cook, I would never go back now! Big fan of the keto diet and the use of coconut in particular! Have been on the diet since my friend introduced me a couple of years ago and haven’t looked back. I’ve recently started using coconut oil in my cooking after my wife suggested it. Do you have a particular brand you prefer? Or are most coconut oils (of the same variety) pretty much the same? I’m new here! Trying to cook healthier for my family and I. I started cooking with extra virgin oil and now would like to try coconut oil. Thanks for all the tips on your site. I love cooking with coconut oil! It’s such a stable and healthy oil. And what’s great about it is that if it fits your recipe, you can use the virgin one which is the purest, but if you need something neutral, a good quality refined oil works great without the coco flavor. how do I make breaded flounder wit coconut oil? OK- I’m border-line diabetic, on meds and checking my blood-sugar 3-5 times a day. Is coconut oil better for me to use then like Canola oil or other s like Wesson Oil & Crisco, etc.? Thank you so much for the FREE e-books! I look forward to reading them and finding out more about how coconut oil can improve our health. My husband and I have both used coconut oil in our morning oats for the past few years without knowing that there were so many other ways to use and benefit from the product. I tried cooking with coconut oil and everything stuck. I don’t want to use cooking sprays anymore but don’t know what else to do. Any suggestions? thanks for tip. I bought Lou Ann coconut oil, solid an was not sure how to handle it. Thanks for the tips. You are absolutely right Tiffany, extra virgin, organic coconut oil is the best you can use, some of the cheaper varieties on offer have been shown not to be of much nutritional value. Some great tips on cooking with the oil thanks. A question….but first….Thank you for your work! 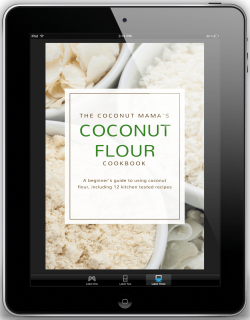 I am so exited to use the coconut flour I just bought! Not able to eat eggs. I recently learned that psylium husks are a great “binding” agent for gluten free baking because they don’t crumble like guar and zanthum. I tasted sprouted millet and quinoa bread done with psylium and it is amazing. Have you ever tried psylium in your coco baking? If not…do you have any suggestions on amounts? This could be really big for people who need to be vegetarian and gluten free for health concerns. Thank you! Thank you kindly for the information. I will be transitioning to coconut oil as of April. Hi everyone, I had eared so much about how healthy is coconut oil, so I bought one to try, my questions: can I use it for everything I cook? Rice, meat, potatoes, etc? will it live a coconut taste? Thanks im advance for the help. Good article. Very helpful and informative. I just bought some to use for making granola bars and I’m going to use the ice-cube tray trick. I will also try using it in some other recipes in place of butter. Thanks. Hi where can I get refined coconut oil to cook with that doesn’t taste like anything for I don’t like the taste period? I’m also looking for this to not be done via harsh chemicals? If you could help me that would be amazing. ? I have been using it on my toast. Taste much better then butter. I made the best biscuits ever. I also cooked eggs in it and used it to saute veggies for my lentil soup. Very good. Thank you for all your information. I will get more creative in using it. Thank you for all the tips on coconut oil. Found your site very helpful. I’ve recently been using coconut oil for frying/ sauteing fish and vegetables, etc, I have a viking gas stove with a high volume exhaust system.. I am trying to keep the smoke at a minimum but the oil when volatile forms gasses that when cools and reform sticks too everything. I have started to get a rancid smell in the exhaust, cabinet walls get covered(figuratively speaking) and gross oil in grease collection pans. Never happed with EVO. What am i doing wrong?? How do I know when the coconut oil is no longer usable. I fried some wings in it and the color is like an dark Amber. Can I still use this oil or is it burnt. I did not have a thermometer to see if it was at 350 degrees. I usually use mine twice before I toss it. If it doesn’t have an off taste then it should be fine to use. I want to start a healthier lifestyle, I bought organic coconut oil today. I need help learning to incorporate it into my cooking. Thanks for the great article! Never thought about pre-melting into cubes for cooking with. Do you know “HEMANI” pure natural Sri Lankan coconut oil? Hi Tiffany! This is really great! I also bought your suggested pop-out trays. I live in Oregon, too — hey, the weather has been so hot, even with my air conditioning my oil is liquid. 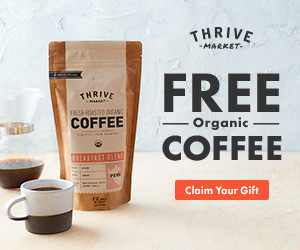 I bought my first jar of coconut oil at Thrive Market, online. They deliver free if you buy $50 worth of food. Amazing prices, all organic and free traded. Highly recommend this place. How can you know if chemicals have been used to process the oil? Does it say anywherd jn the jar? I use the brand spectrum. I know you dont like it but I am not sure why. It is because of the flavor or because it is processed with chemicals.? I have never used coconut oil before. I know very little about it. However, I had heard one should use organic. The one I selected is brand name: Spectrum. Label info: expeller pressed, organic, virgin, coconut oil, unrefined. What do you think of this selection? How do you transfer your bulk coconut oil into a smaller jars? I’m having trouble doing a veggy sauté in my pan with coconut oil, it just burns up and crackles intensely, temperature too high? Yes, your temp is too high if that’s happening! Hi Jo~ As I mentioned above and in the article, Virgin (unrefined) is best but if you don’t like the taste of virgin coconut oil for your cooking you can use expeller pressed organic coconut oil. The brand I use (tropical traditions) doesn’t use chemical solvents or additives. what’s the best way to whip coconut oil? 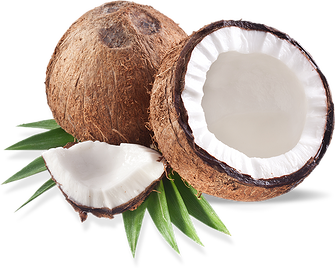 The simplest way I found to melt coconut oil is to place the jar in a pan or large bowl and fill with very hot tap water. Let it set for a few minutes and shake. You may need to weight it down with something heavy to keep plastic bottles from floating. Hi….just want to say that I’ve used the microwave to melt coconut oil with no problem. It takes no time at all and any unused just goes back in the jar. thanks, love your information and ideas. I read somewhere online the other day that coconut oil is “not” good for you in a daily basis that it’s one of the “bad” saturated fats. I come to your page everyday and just wanted to double check with you on it being used everyday. I’m tired of the junk being sold at the stores, I’m too scared to use anything on my son during bath time, rash, etc. He’s had eczema since birth and nothing has helped. We’ve tried all the over the counter things plus tons of prescription medications and nothing is helping. I’m looking for all natural, homemade products which is why I stalk your site on the daily. allergies they found out he was allergic to some foods. Once the foods were eliminated from his diet his eczema is also gone. Please also check for food allergies as in some cases eczema is caused by food allergies and doctors fail to make that connection. Just wondering how long coconut oil remains fresh and useable..several years ago I had a 5 gallon pail of coconut oil…after several years, it started to form tough little beads of oil. Recently I purchased a small container that started to form these little beads after only a few weeks of purchase…is this a quality related issue, age or what? I just tried oil pulling for the first time. WOW!!! My mouth feels so clean and fresh! I could only hold the oil for 10 minutes…going to try to work up to the 20 minutes! I am so glad I found this site!!! We make gluten free cookies for our grandson who cannot have gluten. We tried using coconut oil, but the cookies ran a bit. Flat . Should we use less? Or is coconut oil easy to change out in recipes ? Hello, I love coconut oil and have used Nutiva in the past. I recently purchased it in their new packaging and the label now says that it is bottled in a facility that also bottles peanut oil. Not sure if the previous packaging said that but I read every label and don’t recall seeing it on there. Is there any coconut oil out there that is not processed alongside peanut oil? My daughter is highly allergic. In reference to the statement- “Make sure to only use refined coconut oil that has not been processed with chemical solvents”, I’m assuming you meant UNrefined? Hi Christine, no I meant refined. Some refined coconut oils are refined with chemical solvents but the brand I recommend in this article are actually refined without chemicals. It’s the UNREFINED Coconut Oil that is the one that should be used. Unrefined is pure. When a recipe calls for melted coconut oil. I melt it in the microwave and any extra I just pour back into the container. Is this something I should or shouldn’t be doing? Luanna as it gave no such taste but I now found out it is not as healthy. Can you suggest any type of coconut oil that will give us the health benefits without the ” candy ” taste? Hi Sonia, Tropical Traditions makes an organic expeller pressed coconut oil that is tasteless. My husband prefers I use the refined oil over virgin for the same reason. Is it true that Luanna brand is not as healthy? How so? And also, is coconut oil microwaveable? Thanks! I’m new to coconut oil and am just learning how to cook with it. & it helped me out a lot. I’m hoping to provide one thing back and help others such as you helped me. Loving on this post today! I recently bought a jar of coconut oil at Trader Joe’s + have been wondering how to cook with it exactly. Great tips! Is coconut oil not microwaveable? Should I reheat my food (cooked with coconut oil) with microwave? No, you must re-warm all goods made with coconut oil in the oven (non-convection). If you heat it up in the microwave, the coconut oil molecules quickly break down into sorbetroil, which is extremely carcinogenic. I started using it in my whole wheat bread recipe and it has extended the shelf life by several days! It now goes stale before it gets moldy, which NEVER happened before. Your coconut oil mayonnaise is fabulous, but I lost the recipe. Could you send it to me please? I’ve been lucky and had no hassles switching almost all oil use to coconut- I love the stuff! I sautée with it, roast with it, bake with it, and pan fry with it (pastured eggs lightly fried in coconut oil – out of this world yummy!). Note with baking, when using as a butter sub, it can be a bit drier than butter so I usually add a tiny bit more of whatever liquid is in the recipe to compensate. I love the ice cube portions idea and will try it soon! Are there any tips or tricks with whipping it? We get our organic unrefined cold pressed coconut oil at Costco – $17 here for 54 ounces! I hope they never stop carrying it bc it’s fantastic in quality and price!